The waiting's over! 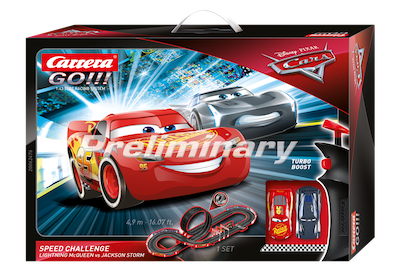 Lightning McQueen and Jackson Storm put their feet to the floor for the new season! The bright red livery of Lightning McQueen's ride goes shoulder-to shoulder with the all-in-black look of Jackson Storm as they burn up the blacktop around the 16.07 ft. Carrera GO!!! racing circuit. The high-speed straights, a risky loop and breath-taking bends guarantee fantastic racing thrills for enthusiastic racers of all ages in their favorite drives.